We popped into Yellowtail last Tuesday night and were struck by two things: 1) how busy it was; and 2) how pristine Akira Back‘s sushi and sashimi continues to be. The other thing that struck us was how much we liked his seafood dynamite — a melange of king crab and rock shrimp tempura, scallops, pearl onions, corn, hon shemiji ‘shrooms, all baked under a serrano-chile-citrus aioli and garnished with micro cilantro. We usually like seafood baked with mayonnaise about as much as we do heavy metal concerts, but in the hands of a master like Back, this concoction packed an umami punch that we still can taste. Back’s nigirizushi (“hand-formed sushi”) remains top drawer — even if there isn’t a sushi bar at which to order it — and for a volume restaurant in a busy hotel, it is as finely tuned as you will find. His gyoza (pork pot sticker with tomato salsa) were delicate and sweetly porky, and the anago (salt-water eel) he serves here will make you rethink your attitudes towards this slithery swimmer — it being a meatier version of the more common unagi (fresh water eels) most sushi bars serve. About the only thing we don’t like about Yellowtail is how tough it is to get a seat here (even on a Tuesday night! )…and how truffle oil pops up on the menu from time to time. 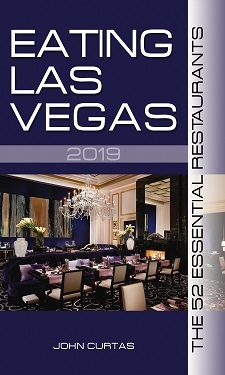 Bellagio’s conventioneers may not mind, but most foodies will silently subtract points for such an ingredient faux pas. ELV’s meal above was comped.